Visit a research base in Antarctica with National Geographic where the aim is to make fresh produce a part of extraordinary life there — and on Mars. A land of unrelenting wind and ice, Antarctica is about as far from verdant as any place can get. Yet cucumbers are growing on the continent’s coast. Next to them, bunches of leafy swiss chard, fresh herbs, and peppery arugula thrive. 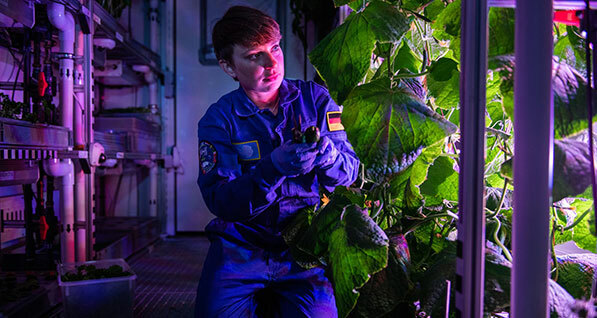 These greenhouse vegetables are the stars of one of several scientific projects underway at Neumayer Station III, the third iteration of a German research facility run by the polar science-focused Alfred Wegener Institute. The greenhouse’s primary purpose is pretty lofty: It’s a laboratory for studying how to grow food in outer space. Specifically, the researchers working there want to know whether astronauts can make fresh produce part of their diets if humans finally make it to Mars. Aside from the International Space Station (ISS), Neumayer may be one of the best places to investigate this issue. Located on the east coast of the Weddell Sea, on Antarctica’s Ekström Ice Shelf, the facility is reachable only by plane or icebreaker and only during the Antarctic summer, weather permitting. “Basically, you could live an entire year in the station without leaving the building,” Horvath says. A rotation lasts 14 months, and during that time there is only one food delivery. Civilian visitors are not allowed. Given the remoteness of the location, it’s imperative that one of the team members be both a medical doctor and a surgeon…. …. The greenhouse is already showing researchers how plants might thrive in deep space. One intriguing challenge they’ve overcome is how to tend the garden remotely. Everything is grown aeroponically, which means the plants are suspended and the roots are exposed to air below. Nutrients are delivered via a sprayed solution rather than soil. This spraying — along with temperature control, lighting, and carbon dioxide adjustments — is operated from a mission control center at the German Aerospace Center in Bremen, Germany. So far, the system works beautifully. And based on the reaction from the crew at Neumayer Station, a greenhouse like this one could dramatically improve life in outer space….. 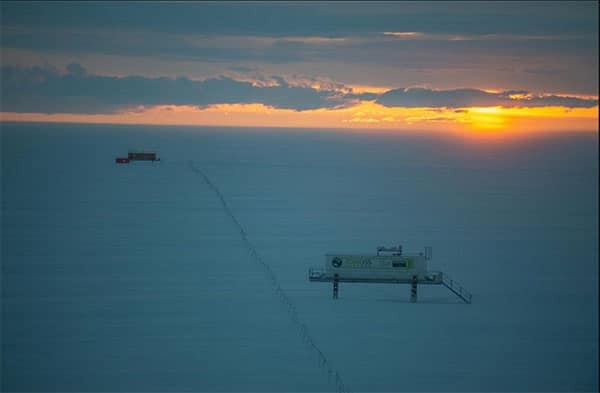 The sun sets over Neumayer Station’s greenhouse and meteorological observatory. The two buildings are connected by a fence that scientists use as a guide during white-out weather conditions.